Fifteen year old Zoe has a secret - a dark and terrible secret that she can't confess to anyone she knows. But one day she hears of a criminal, Stuart Harris, locked up on death row in Texas. Like Zoe, Stuart is no stranger to secrets. Or lies. Or murder. I stumbled upon this book on a random trip to a book shop and I am so glad I did! 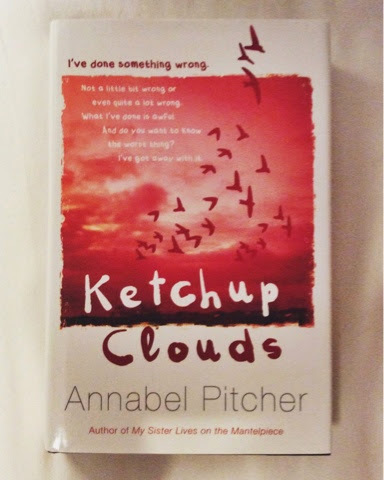 Ketchup Clouds is one of my favourite reads of 2013. Sometimes Zoe was quite unlikeable on how she treats Max, Aaron and her parents, however, Pitcher made up for this by showing us a softer side to Zoe when comforting her younger sisters. I especially liked the way Zoe communicated with her sisters and was always there no matter how big the problems in her life were. I definitely recommend this book to fans of YA novels!